Evolution or creationism: do we have to choose? Can science and faith add up? When Richard Dawkins, evolutionary biologist and award winning intellectual, wrote The God Delusion, containing scientific arguments against the existence of God in 2006, it caused quite a storm. Some Christians welcomed this as it got people talking about God; others didn't. High-profile debates took place, and countless newspaper articles and books were written in response. It asks the tough questions and gives young people the information they need to decide. Do miracles happen? Who is God? And where? Why Genesis 1? Is faith blind? What is 'faith' anyway? Delving into all these questions and more, Neil Laing puts both God and science under the microscope. Exploring literal approaches to the Bible and purely scientific views of the world, he reveals how each has misunderstood the nature of faith and their own limitations. He also includes sections on famous scientists who are Christians, the top ten questions asked by teenagers, and details about resources, organisations and further reading. Might it be that a correct understanding of God actually builds faith in science and vice versa? When it comes to belief in God, Neil shows that faith and science really do add up! 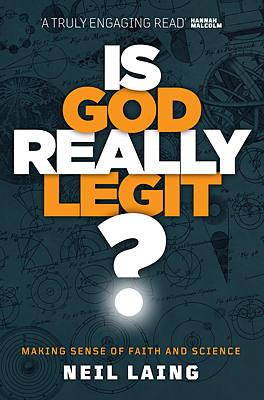 Is God Really Legit? by Neil Laing was published by Instant Apostle in March 2018 and is our 46797th best seller. The ISBN for Is God Really Legit? is 9781909728837. Reviews of Is God Really Legit? Be the first to review Is God Really Legit?! Got a question? No problem! Just click here to ask us about Is God Really Legit?. Details for Is God Really Legit?